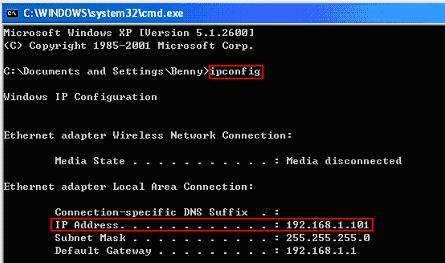 Wanna check IP address in Microsoft Windows? Follow this simple way to find out. This is an easy task! IP (Internet Protocol) address is the 32-bit address used to identify your desktop computer, laptop, router, switch or other network devices in your network or Internet. The address is assigned to network card (can be wireless adapter or wired network adapter) on your computer to communicate with other network devices. This is quite similar to the address of your house for your friends to send you mail or come to visit you. If there is incorrect IP address or no IP address assigned to network card on your computer, it won't be able to communicate with other computer or access to Internet regardless it's wireless or wired connection. 1) Go to Start and click Run. 2) Run window will appear. Type in cmd and click OK.
3) Command prompt window will appear. Type ipconfig and hit Enter button. You will then see the IP Address of your network card, which is 192.168.1.101 in this case. It also shows you Subnet Mask and Default Gateway. As you can see here, Subnet mask is 255.255.255.0 and Default Gateway is 192.168.1.1. Don't quite know what is default gateway? It's the LAN IP address of your router that knows how to route your network traffic to correct destination server. Most of the time you should be able to ping this default gateway IP address too. Note: Please read your IP address information correctly by identifying correct network card. From the output here, I’ve one network card and another wireless card in my notebook. Please note here no IP address is shown for wireless card because it’s not connected to any wireless network. Note: If you want to learn more about this ipconfig command, type ipconfig ? Return to top of "Simple Way to Check IP Address in Microsoft Windows"! !